Scarification is a popular practice among young girls in the Surma tribe of Ethiopia. This painful practice is endured voluntarily by the recipient and is found attractive by the men of the tribe, mostly due to it being indicative of a young woman’s emotional maturity and willingness to bear children. Whilst incomparable to the brutality of genital mutilation it is an extremely painful process, though most young women would be likely to express their pain as it would bring shame to their family. Designs vary from delicate spirals of raised flesh to complex yet finely detailed patterns created with pixel-like scars. The significance of scarification in Surma culture is perhaps more than one might first think. Whilst women are scarred to make them more beautiful and desirable within their tribe, the men may scar themselvesfor other reasons such as marking killing of an enemy. The scarification process involves carving intricate patterns into the skin using a sharp edged instrument. The open wounds are then embalmed in plant juices ground charcoal or even gunpowder which in turn causes a slight infection. When the infection clears up the scars are more prominent and the desired effect is achieved. The scarification process is something that continues throughout the lives of Surma people and scars can be altered or added to as an individual grows. Apart from beauty and maturity they can symbolize various aspects of the person’s life such as social status, religious or political roles in the tribe and mark which ethnic group or family they are from. The Surma tribe inhabit in the south west of Ethiopia, along the borders of Sudan and Kenya. 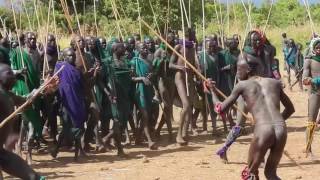 They have preserved their rituals and their customs as The Donga, which is a violent tradition of fierce combat between young men who fight with 2 metres long sticks. Watch the documentary on youtube!! This photo essay focuses on the community of Dima, a village in West central of Ethiopia. While Dima has abundant sources of gold, industrialization isn’t possible due to it being scattered over a large area in small deposits. This means that although it doesn’t provide a beneficial source to large companies, it does attract a large numbers of aspiring prospectors who have carte blanche to try their luck at making a living by extracting the gold themselves. These ‘miners’ generally prefer to work at night when, equipped with whatever they can get their hands on, they begin digging wherever they choose. There is little method to their work other than luck leading to random hauls of anything between a measly 1g and 10g per day’s work. Gold mining has been practiced in Ethiopia for centuries. The same miners are digging long tunnels in the ground, no modern machinery, with pick and shovel they spend their days full of sweat and sacrifice, and sometimes go weeks without finding gold. Merhaba! A small village in an area of outstanding beauty, Dalyan is historic, unhurried and very hard to leave. Set on the west corner of Turkey’s Mediterranean coast, Dalyan is an unspoilt village surrounded by pine-clad hills, cotton fields and miles of untouched coastline. A traditional little fishing village nestling on the riverbank near Lake Köycegiz, it’s close to the astonishing rock tombs carved out of the local cliffs 2.500 years ago. Amazing and surprising city… that’s one of the values, among many others, that makes New York a special place. I leave behind the Skycrapers, chic restaurants, trendy shops and tourist areas of Manhattan and I start walking into neighbourhoods such as Queens, China Town and Harlem, all them unique, genuine. Charismatic people, constant movement of traffic and motley people, diversity of culture, style, races…. New York, as people say, is the City that never sleeps. This photo-essay focuses on the community of Gavani in SouthEast Romania. A remote village which 21st Century Europe seems to have forgotten, and where life is hard. The people of Gavani are humble and seemingly happy. There is a stark difference between the activities of the inhabitants, some working long days for a pittance whilst others keep themselves entertained as they watch time go by. Most men seem to fuel their daily activities with the constant consumption of alcohol and cigarettes. Women look after their homes and their animals, a responsibility they expect to undertake after getting married. The overall impression, however, is that the people are waiting for something to happen, and it is this hope that keeps them smiling whilst going about their daily lives. The intention was to portray the day to day life of ordinary people in the area and capture their smiles and vibrant colourful surroundings, which seem to almost contrast with the prospects and ambitions of these people, which although we might see as mundane or bleak, don’t seem to affect their spirit. It is worth mentioning that whilst the area is not representative of Romania as a whole, there are undoubtedly several small communities around Europe that share characteristics of Gavani, and that perhaps this is somewhat shocking given the huge divide between the way we live in other, more affluent parts of the European Community. Essentially Gavani appears to be one of the communities forgotten by the passing of time and the “progression” that has occurred in its neighbouring regions. Perhaps this small community can help us appreciate what we lose as society evolves. This photo-essay focuses on the people of “The Gambia”, the smallest country on mainland Africa, mostly surrounded by Senegal with a short strip of its coastline surrounded by the Atlantic Ocean at its western end. I have to admit I was surprised to see the happiness of the Gambians, above all the young children. They live very simply, without many expectations of the future. In spite of this, they preserve their smile and sense of humour. It is therefore unsurprising that The Gambia is known as “The Smiling Coast”. Up until now The Gambia is undeveloped and is beginning to invest heavily in tourism, despite this it retains much of its “virgin Africa” atmosphere and visitors are made to feel very welcome above all due to the beaming grins and vociferous salutations of the local people. We would say that life there is not at all comfortable, particularly for the average local person, yet the genuine smiles and friendliness never fade and it makes The Gambia a thoroughly pleasant place to be. The intention was to do a series of portraits of the local people going about their lives in the normal way, to show the variety of strong expressions that one can expect to see throughout the country and to give everyone an insight into the people of The Gambia.